You are not logged in. 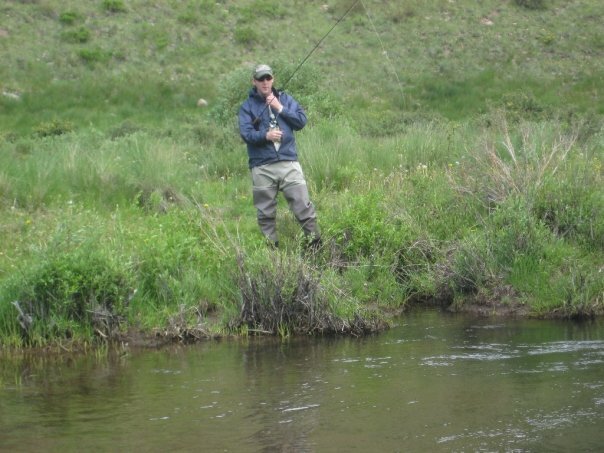 [Log In] BackcountryForum.com » Forums » OTHER BACKCOUNTRY ACTIVITIES » Backcountry FISHING » Reduce Your Food on a Trip and Rely on Fishing? #131707 - 04/07/10 12:27 PM Reduce Your Food on a Trip and Rely on Fishing? How do people plan out their calories and food with caught meals in mind? Just a general question, but feel free to talk about a specific trip - like how many meals would you (if any) rely on catching for a 3 day trip? Assuming you know the trail and have experience at a particular watering hole or river. New to the idea of fishing on the trail, and I am hoping to take several 2-3 night trips this spring and summer where I do a lot of fishing. I know at first I will pack with all the food I normally would, but was wondering how much people are willing to risk leaving behind and rely on fishing. Personally, I'm not too willing to rely on caught fish. First, fish is not too calorie dense; a one pound trout yields less than 400 calories. I don't know about you but I don't catch too many one pound trout. Second, the dang fish just don't seem to be hungry on your schedule. They may be feeding during prime hiking time and sulking when you are hungry. Finally, you are not always at fish-able water when you need to be. In 1954, I hiked the JMT without any resupply stops. At the time I was an immortal teenager so I started with about 20 pounds of food in my pack at Yosemite. I planned on fish to supplement my diet. I finished the last 1/3 of the trail on less than half rations. I couldn't get the fish I needed for the reasons I listed above. Fish can be a welcome treat from standard trail fare but IMO it is not wise to count on having it when you want it. If I am doing actual backpacking i.e. 10+ miles per day then I generally will not bring my fly rod mainly because of the reasons previously mentioned-- you can just never guarantee that you will be near an adequate fishing source. Now if I am just backpacking in and setting up camp for 4 days and 5 nights near a fishing spot, then I will plan to eat a fish lunch 3 of those days and for dinner maybe 1-2 of those nights. I wouldn't rely on fish to sustain my body if I was putting in serious milage every day. On a 2-3 day trip, I would be willing to leave behind 1/3 of my food - in other words be willing to go hungry one day if I caught no fish. I often walk back to my car on the last day of a backpack with no remaining food. However, be sure you are going in an area with known good fishing. If I am exploring lakes to see if there are fish, I do not depend on catching any. Last summer we did an 11-day trip (no rest days) in the Wind Rivers and caught all the fish we wanted every day and walked from about 8AM to 4PM every day. You still need a bit of carbs with the fish - instant potatoes or cous-cous are good and light. And be sure to take oil for cooking. Also have a good spice kit because plain fish every night for 11 days gets really boring. I cut down our ration from the usual 1.5 pounds per day to 1 pound per day per person. However my husband, who is not as keen on ANY probability of missing meals, added some trail bars and "goo" for his comfort. He made it clear that he was not going to share these goodies if we could not catch fish! I took only fly fishing gear and he took only spin gear. Between the two of us, we always caught fish. He would troll for the big fish (about 14-16 inches - two of these fish were all we needed). If he had no luck, I would go out and catch enough small fish to fill the frying pan. caught fish as a meal substitute. It does however, depend a lot on where you are going and what you are doing. 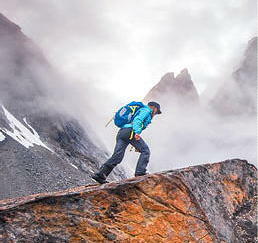 If you are hiking mostly, and fishing occasionally, you may find you don't want to expend the effort. or rely on catching fish you may not want to expend time to catch. If you are doing somewhere to known backcountry fishing locations to spend most of your time fishing, then of course! if you get low on food it's because the fishing was bad and you probably want to walk out anyway..
My experience has always been that if I rely on fish for food, I never catch any! As others have noted, the caloric value of fish is pretty low. Fine for those of us who have extra padding to lose but not for those with the lean and hungry look. Consider the fish a supplemental treat, in the same class as wild berries. hike with a buddy and take lots of sardines in mustard, then you can throw them to each other and eat fish that you caught. Why even bother with the buddy, you could just toss to yourself! Plus, unimpressed that you didn't find a way to incorporate leather thongs either. As stated earlier, trout don't have a lot of calories, so we never count of them for major portion of a meal---just some nice special treats when they happen. thirty-five years ago as a very young man I did a trip with a friend to Colby Lake in the High Sierra. We took along lots of noodles, and lots of Knorr sauce mixes--so we could have trout Strganoff, trout goulash, etc. At Colby Lake the fishing was amazing...as I caught tons of fish, I could see he was doing the same. We each assumed the other guy was keeping his fish. It was a frantic 45 minutes of fishing before dark to get our dinner! do you think you would attract more fish wearing a thing or a kilt? Just wondered which you prefer? Jim- I'll stick to the shorts, but I'd go for a kilt in a pinch. I like spear fishing with the thong on, for that authentic wild-man feel. Incorrect. 3 oz of cooked trout has 162 calories and 23g of pure protein according to nutritiondata.com. That's almost 900 calories and 120g of protein per pound!! Compared to cooked fatty ground beef, that's 70% the calories yet has the same amount of protein. It's basically the same as beef but not all of the unhealthy fat. And what does your body crave the most when you're muscles are being taxed? Protein!! And it even has some decent levels of (healthy) fat, which is important to backpackers. This adds up to some of the best nutrition a backpacker could ever dream of. In places like the Winds, the Beartooths, the Flat Tops, etc any decent angler could rely on trout as a major food source for sure. It only takes 3-4 pan-sized trout for a one pound meal. The smaller fish are easier to eat and are less fatty. And high country lakes are usually over crowded with the smaller trout, so consuming many numbers of smaller fish eases food competition for the survivors. And it only takes 1-2 16" trout to feed you very well. I'm not advocating leaving all of your food at home, but knowing I'm going into an area loaded with trout lets me lighten my packed food weight a little. Freeze dried meals are convenient and can be tasty, but they are loaded with sodium and really don't have tons of calories. I just pulled two meals from my stock to check, and a kung pao chicken only had 560 cals per package and a beef stroganoff had 580 calories and both were just loaded with sodium. My main reason for backpacking is to fly fish high mountain lakes that rarely if ever see humans so I eat a lot of trout. Bottom line is that they are much healthier fare and nutritious than freeze dried packaged meals. On most trips I leave the cooking gear behind and just pack in packaged food and many squares of tin foil for baking trout in campfires. I don't drink coffee or hot tea on the trail so I don't need the stove unless I want freeze dried food. Healthy trout will leave you feeling stronger over the coarse of a long hike. I suspect that the info you quoted included a bit of butter for the frying pan in the calorie data. From the information I have seen, three ounces of raw wild trout contains about 100 calories; just under 35 calories per ounce. When cooked, three ounces have about 130 calories. But, three oz of cooked fish is more fish than the same amount of raw fish; cooking = shrikage. Check out http://www.freedieting.com/calories/trout.htm for one source of trout calorie values. Farmed trout run a bit richer IIRC. Depending on where one is fishing, the keep-limit is between 5 and 10 fish per day. Most wild trout I catch would average between 7 and 8 inches long and after being cleaned yield about three oz of meat, skin and bones (with the head off). Eating five trout this size will give you about 500 calories; a good meal. If you go hiking to fish, this is a good way to eat without having to carry excess food weight. But, if you are not hiking to get to fishing, the fishing can be a time-consuming distraction and, if you are relying on catching trout, can bite into a days mileage. I don't believe that the OP was going hiking to fish; IIRC, he was going to fish a bit more casually. Thanks Pika, that's a very good answer. I remember this from some survival training. the choice was to live in the woods and fatten up on trout, or make for the coast and find people. It turned out you'd have to eat about 3-4 POUNDS of trout before you could expect to "fatten up" at all. Best to head straight out. And that's something those idiots on the Man Vs. Wild ought to know. They consistently spend hours of time and energy trying to get food that has no nutritional value. It's bad advice, all the way round. I suspect that the info you quoted included a bit of butter for the frying pan in the calorie data. From the information I have seen, three ounces of raw wild trout contains about 100 calories; just under 35 calories per ounce. When cooked, three ounces have about 130 calories. But, three oz of cooked fish is more fish than the same amount of raw fish; cooking = shrikage. Check out http://www.freedieting.com/calories/trout.htm for one source of trout calorie values. Incorrect again.......the same website you quote provides the EXACT same nutrition info that I quoted. Go to the area where it says trout, cooked, dry heat (which means grilled or baked in an oven) and change the amount from "one fillet" to "3 oz" and it comes up with 162 calories, 23 g protein. But on that website you can play around with all kinds of the different types of trout and raw vs cooked state and you get all kinds of results. So, let's say its 130 cals per 3 oz.......that's 700 cals of pure protein and healthy fat from one pound of trout flesh - something VERY EASILY had by a decent angler around good trout water. What would you rather have? 700 calories from trout or 700 calories from dehydrated ramen noodles with 10x more sodium anyone should ever eat in one meal? That protein is going to have your fire burning long after that sodium and ramen fizzles out. And when I cook fish in the wild, I generally bake (steam) it in foil with a small amount of cooking oil and spices so I will generally lose very little during the cooking process as you would if you grilled it. And if I am going to rely on trout as a meal, I'm not going to bother with miniscule, little 7-8 inchers. If that's all I can catch, I'll let them stay in the water. I also don't like big trout to eat. If a fishery holds large trout, I say throw em back anyway and let someone else later enjoy the sport of catching a bruiser. Especially large trout are special prizes in the back country....let em go. But the Rocky Mountain back country is riddled with waters that hold trout in the 12-16"+ range and these make for fine and substantial eating. Again, it does not take more than 2-3 of these fish to get yourself a substantial meal. To answer the OP's question - You are obviously hiking to an area known to hold trout and you want to rely on trout and leave some food at home. I would almost never leave behind large quantities of food in the idea that you are going to rely on trout to stay well fed in the back country. Again, any decent angler in areas that are known to hold lots of good trout could rely on fish as the majority of his/her nutrition if they wanted to buy why risk it? You could lose or bust all of your fishing gear 30 miles away form the nearest TH and they you're looking at a crappy, uncomfortable two-day hike out. If you're serious about it and you are a decent angler with confidence......i say you could feel pretty safe leaving 20-35% of your rations at home. Enjoy the fishing and bon appetite. I don't agree that I was incorrect. You are citing the cooked calorie content, I was quoting the raw value. When someone claims to have caught a one pound trout, that is not its cooked weight. After cooking a cleaned fish, the fish will loose about 15-20% of its raw weight from water loss and the calories are concentrated, hence your higher figure. I stand by the info I quoted; raw trout provides between 35 and 40 calories per oz. In fact, we are really quibbling over just a few calories per ounce. Clearly, trout or any other fish, including salmon, is not calorie dense. And my main point was that for someone mainly interested in hiking rather than fishing, relying on catching fish would be a distraction, at best. I am not saying don't catch and eat fish: I'm saying don't rely on catching fish for a significant part of your hiking diet unless you don't mind being hungry on occasion or unless you are prepared to spend a significant amount of your time fishing. Stopping by a rushing mountain stream after a full days hiking and catching enough fish for dinner in a few minutes can happen but in general it is just a pleasant fantasy. In my experience, fish are just not that cooperative. You are clearly a far better, and much more serious, fisherman than am I and so I will have to accept the reliability with which you can catch fish, especially large ones. Personally, every time I have tried to rely on catching fish for food in the years I have been hiking and climbing, I have never caught enough fish to keep me well fed. HYOH. One other item on the "nay" side--if you're at timberline or above where campfires are not allowed or there are campfire bans because of the fire danger (every summer in the northwest), you're going to have to carry more fuel to cook those fish, which will add to your pack weight. (That assumes that otherwise you only boil water to rehydrate dried food--if you're a gourmet camp cook, it won't make any difference.) There's also the issue of needing either a fry pan or a bunch of foil for the cooking and extra fat of some sort. That being said, I plan to return to Wyoming's Wind Rivers next summer, Lord willing (at my age, gotta add that caveat!). My grown children, bless their hearts, got me a lovely Tenkara rod for Christmas which has renewed my enthusiasm for fishing. It's a more expensive and sophisticated version of the method I learned to fish with as a child, a willow pole with the line tied to the end. I will be in a couple of prime fishing areas, mostly off-trail (thanks, Wandering_Daisy!) and have (not coincidentally) planned layover days in those places. If I don't catch any fish, I'll just have to subsist on side dishes those few days! It's not as though I can't afford to lose weight, lol! Since my protein source would otherwise be dehydrated, any food weight I save will be more than offset by the tackle, the frying pan and extra fuel. In other words, I'll be doing this for fun, not to save any pack weight! There's also the issue of needing either a fry Since my protein source would otherwise be dehydrated, any food weight I save will be more than offset by the tackle, the frying pan and extra fuel. In other words, I'll be doing this for fun, not to save any pack weight! I guess I have two systems depending on what my trip itinerary is. If I am just hiking in to one place and setting up camp for a few days and then moving on, then I don't mind lugging around a 2lb frying pan, my canister stove, extra fuel, fish seasoning etc. However-- I certainly wouldn't like to carry all that+plus my usual food+2L of water+the rest of my fishing gear if my agenda was multiple 7+ mile days. It would hardly seem worth it to me, in which case I would just bring the rod, reel, flies and selected terminal tackle with me, and forfeit the fresh fish for lunch/dinner as I would rather be comfortable while hiking the mileage. I do VA and WV. I love backpack fishing, but I do catch and release. I have a spot that is guaranteed to provide enough brook trout for my needed nutrition, but I still do catch and release. For all areas other than this "special" spot, I can't count on fish. In those areas, I may plan for fish meals, and sometimes I succeed of course, but I ALWAYS carry food for meals in the event the fishing doesn't pan out. It is a matter of modern times, I think, wild fish are precious resources that must not be overused; I can handle living on mac and cheese and letting the brookie go to fight another day. I wouldn't count on fish as a sure thing, based on the number of times I've NOT caught fish, even in my "honey holes". I consider fish and game as an opportunistic meal, with the odds of your success being propotrional to your skill level and experience. But suppose I got hoplessly lost and knew I might be in the field a while, before I could reasonably excpect to be found and rescued. I would save my freeze dried and munchies, and begin setting up snares for game, and fish traps, and making a fish spear, if there was enough water near by to hold a population of fish. I'd use my freeze dried and other items, when unsuccessful at snaring rabbits or what ever, in that scenario. If I fish now, it's just for the fun of it, but I wouldn't mind keeping a catfish, crappie or trout for dinner. The way I figure is, if I catch fish I will pour part of my dehydrated dinner off into another freezer bag before rehydrating-as much as half if I catch enough. The leftover food can be used on another trip or as emergency food, or (if you don't have to get home and your family knows this may happen and won't call SAR on you) you could spend an extra night out there. Of course if this happens for more than one night, a mixture of chicken alfredo and baked beans might make for an interesting dinner! Trout for breakfast tastes great, too! It all depends on where you are going, at least that is the major factor I consider when planning meals for a trip. In the Uintas, Winds or Alaska (I frequent the Arrigetch Peaks region) I have had no problem landing 50% of my calories in convenient, yummy, scale-covered packaging. At other venues, like the northern Cascades or Sierra Nevada (Tahoe to Yosemite) I find the finned denizens to be much more selective feeders. I can catch them, but it is more time consuming. Out east (Smokies for example), the snobby little fish act like I am trying to eat them or something and avoid my flies like a plague ship. I will also add something to this calories/fish debate. Eight ounces of trout meat down the hatch will provide at least 400 calories. Second, those are highly digestible calories your body will extract efficiently. Consuming 400 calories of re-hydrated yuck will yield significantly less useable energy - in other words a lot more re-hydrated food will pass straight through you. I will say that all my hiking trips I stay the night at a water source, either a pond mountain stream or lake and I normally figure to catch my food in half of them, and I catch fish in almost all of them actually. Never have I gone hungry either... And a small Johnys seasoning and foil is all I really need. But my first loves fishing then hiking... Normally I travel 6-10 miles a day so I have plenty of time to fish. I have not read this post I a while. The decision to leave out some food to be replaced by fishing depends on your willingness to fish, your ability, where you are going,and your feeling about taking a chance of going without. I find that backpacking and fishing go well together. I am not able to walk hard from daylight to dusk. Even with 8 hours of walking, in the summer, I still have time to fish in the morning and evening, when the fishing is actually better than during the day. I rarely fish for more than 1-2 hours. I only fly fish. The last few years I have been paying more attention to what other backpackers say about where the good fishing is located. I have been quite successful the last two years, both in the Sierra and the Wind Rivers (where it is really hard NOT to catch fish). Remote back country lakes do not get much fishing pressure. The fish are pretty dumb and hungry. I am not a good fisherman (you would laugh if you saw me cast a fly), but I catch plenty of fish. As for matching hatch, never have done that. Those hungry high alpine lake fish will strike at anything, as long as they are feeding. And that is the key. Fish when they feed. Most often, cleaning the fish takes longer than catching them. The benefit of one 13" fish vs six 8-inch fish is the saved time because cleaning the one big fish does not take much more than cleaning one small fish. By the way, the small fish are often brookies, and in most places there are higher limits on brookies - usually 10 or more. I find it hard to find protein sources in dried food I use for backpacking. Easy to get carbs, easy to get fats, but much harder with protein. My backpack food is usually 15-18% protein as calorie percent. Fishing is a great way to boost that up. As for extra fuel to cook, not necessarily so. I simply drop the cleaned fish in the pot as I cook the pasta, or rice, and then pull it out, take out the bones, and put it back in the one-pot meal. When I am where I can have a fire, then I fry the fish. My fishing gear weighs 11 oz total. I go very minimalist. No net, use a spare shoelace for a stringer, one film canister of flies, one extra leader, no extra line, a split foam pipe insulation for a rod carrying case. I only take the amount of line that I can cast, and since I am lousy at casting, I do not have to take much! My light small reel is less than half filled. I also take a 1 oz paring knife. These are the cheap ones you buy for $2. They are really sharp for a while, but do not hold an edge. At $2, I just get a new one for each trip. For me, the hiking is #1, photography #2 and fishing #3 priority. Even at that if I take my fishing gear, I drop my food to 1 pound per day vs 1.3 to 1.5 pounds per day without fishing.